I immediately knew what I was going to be drawing. There’s a character drifting around in my head, I don’t have a name for her yet, but she fits quite well. She’s the old shaman and mentor for a fictional clan of herds-people who travel through these glacial highlands and lower steppes throughout the year. She’s the magical cornerstone of the clan, the mentor and guide to many of these people. She brews salves and potions for all kinds of ailments. She is elementally attuned to ice, and uses her magics to enhance her alchemy (mostly by reducing the space needed for condensing coils because she can manipulate the cooling directly using her magic). While I don’t know how many spirits she mantles and communes with as a shaman, I know that she has an unusually strong bond with the spirit of the eagle. She is marked by this bond with hawkish features and a feathery brow. 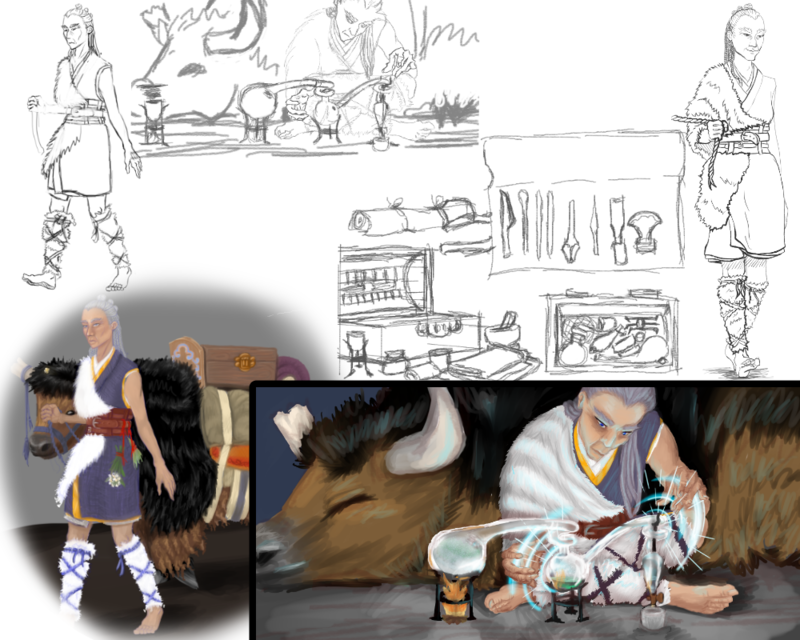 Of the paintings I’m most happy with her yak companion. I Could Not get her skin tone where I wanted it, and I am probably going to try again at a later date. Shes’s supposed to be weathered by sun and wind, and I just did not have time to capture that this time. Also while I’m not satisfied with her face at all in the alchemy painting, it was a fun first try at multiple light source illumination. I definitely need to go and practice that some more too. Yay learning! Also yes she’s crazy. I said they visit glacial highlands. Nobody else in the clan wears so few clothes just out and about; however, as an ice magician she has developed an appreciation for being in direct contact with her element. Also I don’t think she’s ABLE to get frost bite the conventional way. As always I’d love to hear what you beautiful people think. Drop comments here, Facebook, Twitter, or even my patreon feed!